Hall Farm also has 3 Craft Workshops on site. 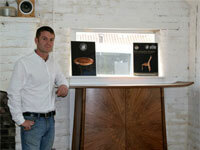 Tim Rinaldi who creates beautiful contemporary furniture to commission. 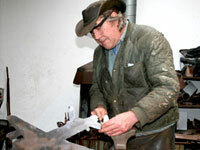 The Spitfire Forge run by Dave Payne, who specialises in artistic ironwork. James Sutton ARBS an Artist/Sculptor. Tim creates beautiful contemporary furniture to commission. Work is undertaken on furniture of all descriptions, using only the finest quality materials to create stunning pieces which will stand out in any room. He takes great care to ensure that his client's own particular needs are catered for and all designs are tailored to their wishes; thus creating a unique piece of handmade furniture that is personal to them. Dave Payne runs a blacksmith’s workshop and forge. He specialises in artistic ironwork, producing both his own designs and work to commissions, and restoration work on period ironwork. He also runs training courses in all aspects of forge work, tailored to the trainees interests and needs. Please contact him if you are interested. An elected associate member of the Royal British Society of Sculptors, James exhibits his work throughout the UK, producing work for private and public collections. James also regularly runs all kinds of creative workshops for individuals, schools and community groups. He is happy to work to commission.